Everything I just read sounds very very expensive. But I’m sure (sarcastic switch: on) this is much cheaper and more efficient than if they let the private industry source and convert their own airplanes. I understand it is weird to think of an old aircraft flying and lasting for a considerable amount of time, but firefighting aircraft do not seem to be the only long lasting, old aircraft. How many U2’s are new? I recently saw an article stating that the Air Force brought a B52 out of mothball status because they needed to replace one of theirs. Does anyone know when they stopped manufacturing those aircraft? I know that the Hercs are old, but so were the DC3’s, even after their update; I’m betting they have a stellar history with the Forest Service after all is said and done. Just FYI…the majority of the current U-2S aircraft were built in the 80’s as TR-1s. There are 3-4 older aircraft built in the late 60’s as U-2Rs still in service, but they’ve all been updated to the U-2S block 20 level. While the original design celebrates its 60th anniversary this year, the current aircraft are much newer and advanced. The B-52s and KC-135s on the other hand, not so new. Glad to see it happen. With all those expenses, since they are government owned, why not just contract with the military/Coast Guard for pilots/crews and maintenance. All the contracts mentioned reduce efficiency of “government owned” aircraft. Aw, what the hell,,,shoot the dice and wear a blindfold…I see we are not afraid to look the fool! We added a map showing a 500 nm radius out of Sacramento, which will usually be the allowed mission range of the HC-130H this year. Because it is a MAFFS system, will it be required to reload at MAFFS only bases (Channel Islands, Chico…). Or is that only for the C130J models? The first generation of MAFFS units were dependent on ground based air compressors to repressurize the tanks. The current units, MAFFS 2, have two onboard air compressors which can repressurize the tanks in 15 to 20 minutes, (if they are working properly, which is not always the case). The compressors enable the MAFFS aircraft to reload at any air tanker base that can handle the weight and size of the C-130. The white tank in the photo HERE is one of two that store the compressed air. The air compressors can be seen HERE. Here’s what we wrote about the system in 2013: 10 things to know about MAFFS military air tankers. When you go to the gravity system, will you still need the Loadmaster? 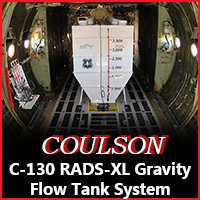 Coulson operates Tanker 131 with a flight crew of 3, and no Loadmaster. What does the third crewmember do? “the plane the plane” some may remember this television program of the ’80’s. The C 130 Fed program reminds me of this show. 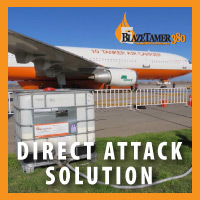 Lots of money, time, and publicity for a 3000 gallon (maybe) air tanker that squirts retardant, airbase limited, and will require a day of rest every seven days. I understand that this is just the beginning and that over the next ten years and a half billion dollars, that the Feds will have what the private industry has been providing for six decades at a fraction of the cost. This doesn’t include Forest Service One the new C 130 that is supported by F.S. management. Maybe there can be some cost savings by reducing the contents of fire line meals? A disaster in the making!. Another government money pit as well..No wonder no seasoned tanker pilot wants to fly them. Coast Guard Hercs are the best maintained aircraft there are! If the USFS maintains them properly & provides quality pilots, they’ll do well. looking at the map – one has to wonder why they don’t base the planes in Boise to get the additional coverage lost to the Pacific Ocean when they are based in Sacramento. There are more fires in Southern Cal then up North, would be one only reason and the Coast Guard that will be supporting the first two aircraft are also based at Sacramento might be another. Who really knows? If there are better ideas floating…standby you will get 12 more replies about it! who is CASS, Inc ??? When did they show up ? Any prior fire fighting experience? C 130? so enlight me again… who the —- is CASS, Inc? Brand new, never heard of it..just showed up and got the contract.. Really? Really!!! I spent 5 years in the USCG at MCC as an HC-130H avionics technician and Navigator with over 1500 flight hours. I have worked on and flown in two of the proposed transfer Hercs and perhaps more. These are incredibly durable and reliable utility aircraft. I believe they will serve the USFS as well as they have served the USCG. Certainly NOT cheap to operate though. But keep in mind they are free (not sure what the going rate is for used ones but new equivalent models would be $35M +/- each). 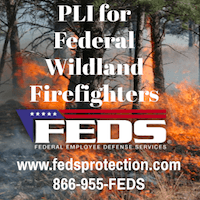 I believe the USFS would do well to hire, train and retain their own maintenance crews. I forgot to mention in my last post… draw a line due east to Richfield Utah (and its 6,645′ new runway and close proximity to Salt Lake City as an alternate) and see what the 500 nm radius looks like. Sure, that’s likely an optimum location…if you had to restrict yourself to 500nm permanently. But the restriction is stated to be temporary, for the first airplane only. It would make no sense to build all the necessary infrastructure (aprons, tanks, buildings, plumbing etc) for the interim, even if they lived in modular trailers. No matter where you base them, the Herc program will not be the salvation of the US federal airtanker industry. Not by a long shot. ok Kevin… are you part of CASS, Inc? It looks like business as usual for the Forest Service, let Cal Fire run the heck out of their helicopters and air tankers. Unfortunate the Feds aren’t watching the fire danger in the timber belt. Yesterday in El Dorado County (Ca.) there was five wildland fire alone which kept surrounding Cal Fire air tankers and helicopters hopping. I wonder if the Fed air program has become so complicated that it is eating itself? Even the Yosemite N.P. 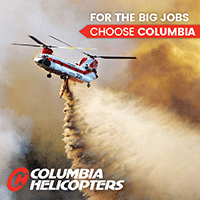 sent their helicopter to work several fires. Unfortunate the C 130 program wasn’t available (May 15th) as this series of fires throughout central Ca. would have been a good opportunity “get started”. Putting a tanker (squirt model) in service (C 130 FED) in an active (crazy) fire season, new contractor, new flight crew, old airplane, seems a little risky. How about May 15, 2016? This concept of the Forest Service operating its own fleet was attempted in the 1970’s with a P2V-7. When money is no object you can afford to maintain and hire……………………….? Will the private air tankers operators put the skids on building up more tankers? What happens if the Fed funding is withdrawn. The answer is back to square one, 2005.